The first BlackBerry KEYone sale India has started via Amazon.in, the brand’s exclusive online partner for the handset. 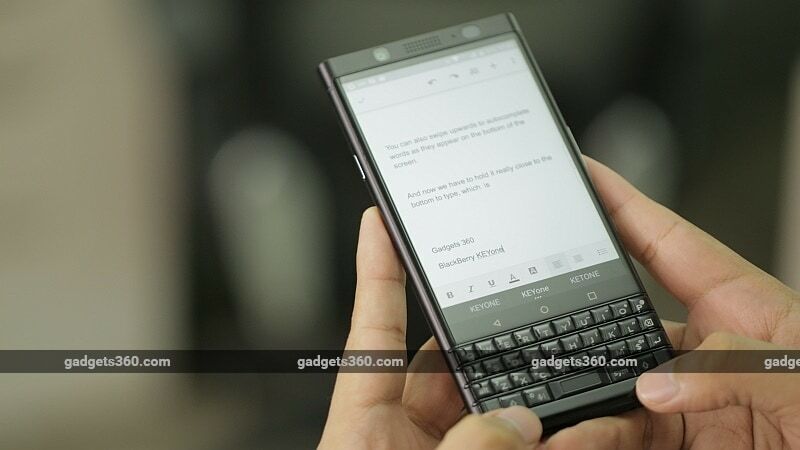 The last smartphone by the former industry titan, the BlackBerry KEYone launched in India last week, and sports a physical QWERTY keyboard, its highlight feature. Powered by Android 7.1.1 Nougat operating system, the KEYone’s hardware keyboard is rather unique considering all other smartphones today sport full touchscreens. As with other BlackBerry devices, the new handset comes preloaded with its own productivity and security apps and platforms to enhance its appeal to corporate users. We reviewed the KEYone last week, and found that despite the numerous productivity optimisations, the smartphone’s attempt to offer the best of both worlds was not perfect. BlackBerry KEYone price in India is Rs. 39,990, and the launch offers include up to 75GB additional data from Vodafone, meant for both prepaid and postpaid subscribers, as well as new and existing subscribers. American Express is also offering up to 4,000 bonus points to credit card members that buy the smartphone. The BlackBerry KEYone (Review) specifications are mediocre, however, the innards are not the smartphone’s highlights. Instead, its keyboard and software features are its main USPs. The company has made some changes to the specifications of the smartphone for India, and the KEYone will be made available in a 4GB RAM + 64GB inbuilt storage configuration, compared to the 3GB RAM + 32GB inbuilt storage configuration that was launched in international markets. The company is calling this model the BlackBerry KEYone Limited Edition Black. The Indian model also supports dual-SIM cards, and the company says this is the first ever BlackBerry smartphone with with dual-SIM card support. So, let’s get down to the specifications, shall we? The dual-SIM BlackBerry KEYone runs Android 7.1.1 Nougat, and sports a 4.5-inch IPS LCD display with a 3:2 aspect ratio (1080×1620 pixels) and a pixel density of 433ppi. It is powered by an octa-core Qualcomm Snapdragon 625 SoC clocked at up to 2GHz, coupled with 4GB of RAM. The KEYone camera setup bears a 12-megapixel rear camera with an f/2.0 aperture, PDAF, EIS, and dual-tone LED flash, apart from the 8-megapixel front camera that sports an f/2.2 aperture and an 84-degree wide-angle lens. As for storage, the BlackBerry KEYone comes with 64GB of inbuilt storage that is expandable via microSD card (up to 2TB) in a hybrid dual-SIM configuration. In terms of connectivity, the BlackBerry KEYone supports 4G VoLTE, dual-band (2.4GHz and 5GHz) Wi-Fi 802.11ac, NFC, GPS/ A-GPS, Bluetooth v4.2, FM radio, USB Type-C (3.1), and a 3.5mm headphone jack. Sensors on board the smartphone include accelerometer, ambient light sensor, digital compass, gyroscope, and a proximity sensor. It is powered by a 3505mAh non-removable battery that supports Qualcomm Quick Charge 3.0, said to charge the smartphone from zero to 50 percent in just 30 minutes. It measures 149.3×72.5×9.4mm, and weighs 180 grams. Getting back to the software aspect of the smartphone, the security apps such as DTEK by BlackBerry and BlackBerry Password Keeper have been preloaded, while productivity apps such as BlackBerry Hub, BlackBerry Calendar, BlackBerry Productivity Edge, and BlackBerry Workspaces are also onboard. The company is of course touting the Smart Keyboard functionality, which offers contextual auto-correction, next-word prediction, and ‘flick typing’ that adapts to the user’s language style.